This building is still known locally as the “stamp factory”. It was built for a company which imported millions of stamps from around the world and packaged them for sale to collectors. 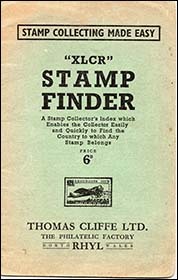 Thomas Cliffe started his stamp business in 1920. By the 1930s his name was familiar to many of Britain’s five million stamp collectors. From his office on Princes Drive, Colwyn Bay, stamps were packed and distributed to various outlets, including Woolworth’s shops. Some stamps were packed for inclusion in cigarette packs. When the business had grown to 50 employees, Mr Cliffe asked local architect William John Bowen to design a purpose-built factory. After problems getting planning permission in Colwyn Bay, he bought land at Marsh Road, Rhyl, and building work began in 1937. The premises were officially known as The Philatelic Factory. The main, central building is where stamps were brought in by the ton, sorted and placed into attractive packets. The company also made stamp albums, stamp hinges (for gluing the stamps to the pages) and philatelic accessories. The Stamp Finder booklet pictured left includes an index to stamps along with texts such as “Know the World through your Stamp Collection”. In the era before jet travel and the internet, stamp collecting helped many youngsters learn about geography and the subjects and events depicted on foreign stamps. The smaller buildings either side of the main one were built as dormitories for female staff. 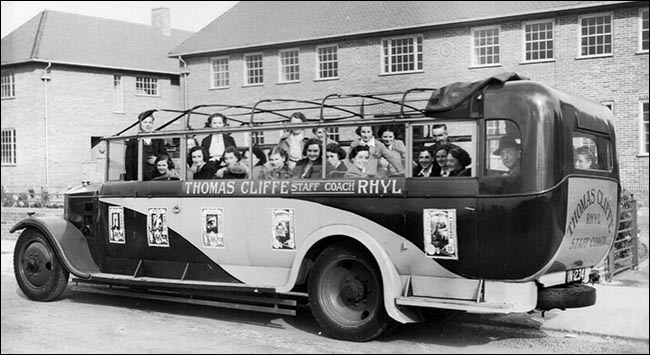 In the event, most of the women preferred to commute daily, so Mr Cliffe laid on a free staff coach to and from Colwyn Bay each working day. The photo above shows some of the women in the vehicle, outside the factory. The coach was adorned with enlargements of exotic stamps. The dormitory building on the right became a canteen and caretaker’s home. The company closed in the 1990s. The buildings are now owned by Denbighshire County Council and are home to the district Register Office and various services and local businesses.